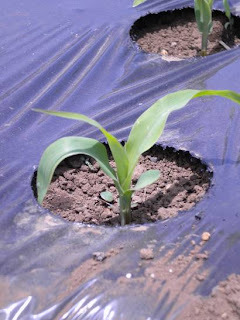 Japan Farmers Markets: Popcorn Seedlings Up! As a self-confessed vegetable geek, my excitement (and little dance) at the sight of my popcorn seedlings will be most understandable. Popcorn is easily one of my favorite foods. It's also a little bit difficult to get here in Japan. I don't believe in microwave popcorn - too much other stuff in there plus the assorted health issues even with the organic types - to the same degree that I believe the air popper a prime example of human folly. So you will grow your own corn and then pop it - that is wonderful! I'm so excited about this...if it works. Fingers are crossed for the growing season to go well! I'll keep you posted. That's fabulous! I love popcorn too, but have never thought to grow it. My boyfriend (a former farmer) grew regular corn for awhile (both as a farmer and a gardener), and I loved it, but eventually it got eaten by some combination of raccoons, skunks and a bear, and that was a bit discouraging. I'm very curious to hear how this turns out. Keep us posted. Hi Sue, Will do! The first year I grew popcorn the majority was taken by raccoons. In the years after, I kept a closer eye on things and have had good luck. No bears (yet) in our part of Michigan or roaming Tokyo, for that matter. My only concern here is the drying process. It's going to be ready to harvest during typhoon season or just after. This will be the biggest challenge, easily. Think good thoughts!